Galley Wench Tales: Oz: Run, Skippy, Run! Kangaroos, a mother and her joey near our camp at Deep Creek, South Australia. Kangaroos – what could be more quintessentially Australian that this unique marsupial native? And what could be more cool than watching them bound in the wild? When you see them, their pear-shaped bodies poised upright on their long hind legs, their small hands dangling down, long, long tail behind -- well -- you know you're not in Kansas anymore! 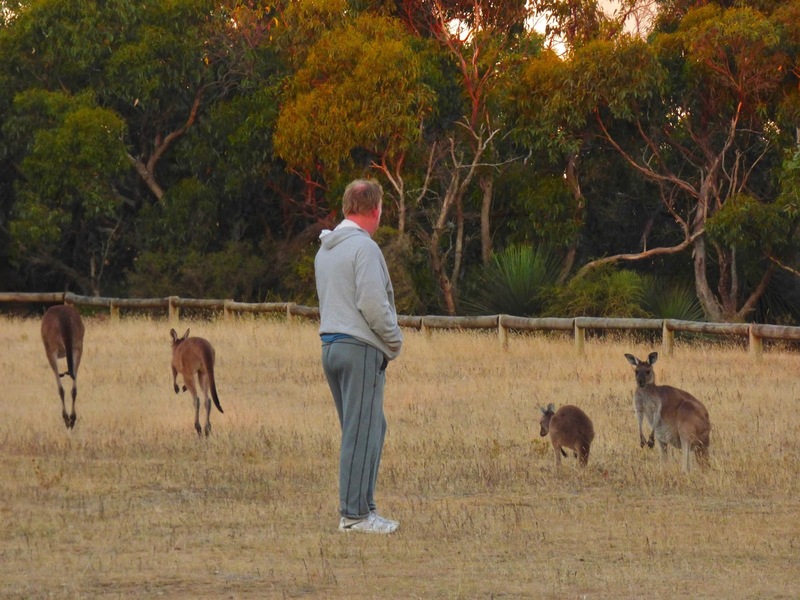 Wayne, watching the 'roos near our Deep Creek campsite. South Australia. Popularly considered the unofficial symbol for Australia, kangaroos are the better-known half on the Australian coat of arms emblem -- they share the honor with the equally endemic but lesser-known emu. 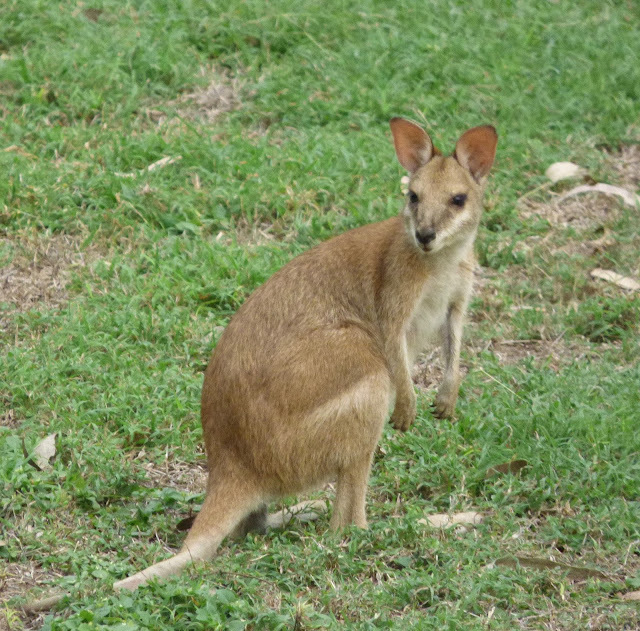 This is the first kangaroo we saw in the wild; Hinterlands, Queensland, Australia. 50-60 million kangaroos hop across the country. 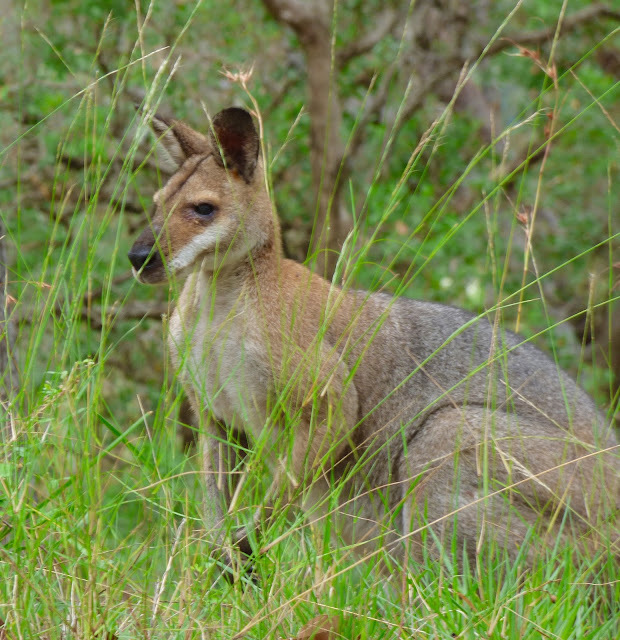 There are twice as many kangaroos in Australia as there are sheep. There are nearly three times more kangaroos than cows in Australia. 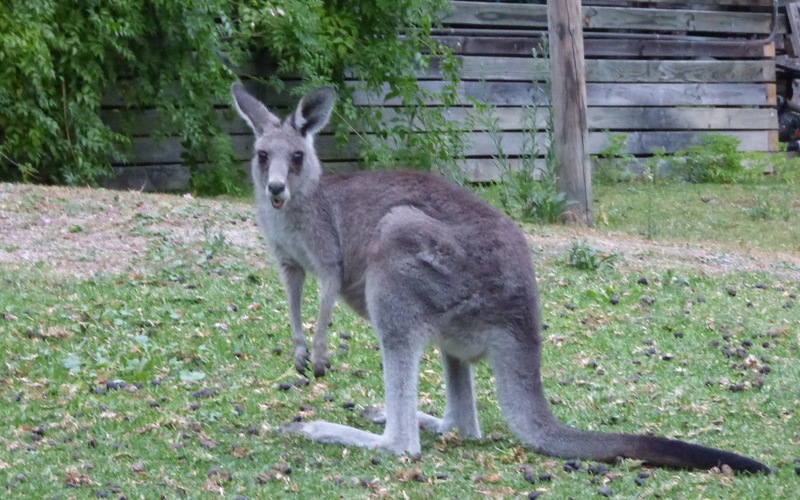 Kangaroos are the most prolific large animal on earth. *While overall the kangaroo population is robust, there are some species threatened with extinction. Bounda, Victoria. Another campsite, another 'roo. While 'roos are perfectly content to hang out in mobs (that's what groups of kangaroos are called) and munch on the grass, not all is copacetic. Signs warning Australian motorists to watch out for 'roos on the road are rampant. "People get killed from 'roos hitting their windshield," my brother warned me when I took my first long driving trip in Oz. About 15 years ago, on one stretch I drove on Australia's West coast, I was shocked to see dead kangaroo roadkill every few feet for mile after mile after mile. 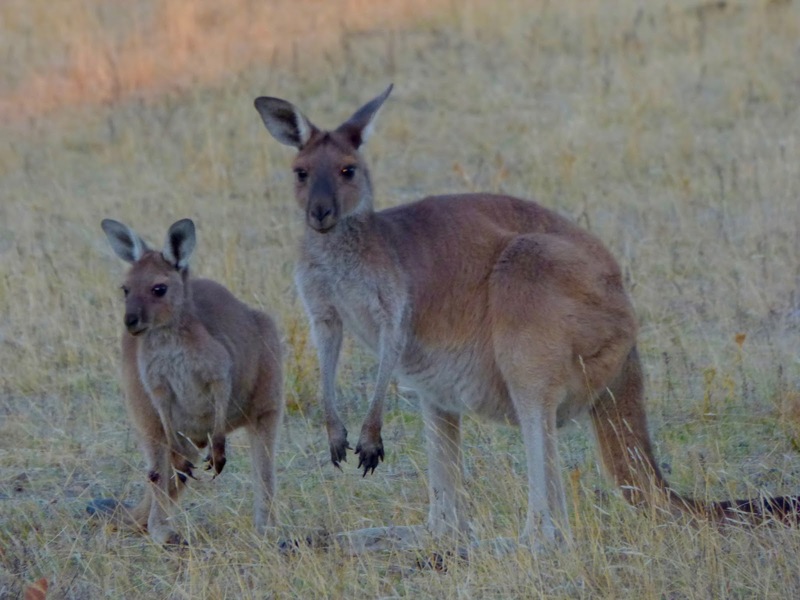 As dusk approached, I kept a sharp eye out for 'roos and a foot poised over the brake pedal, as 'roos hovered at the edge of the road, sometimes suddenly darting across the road. 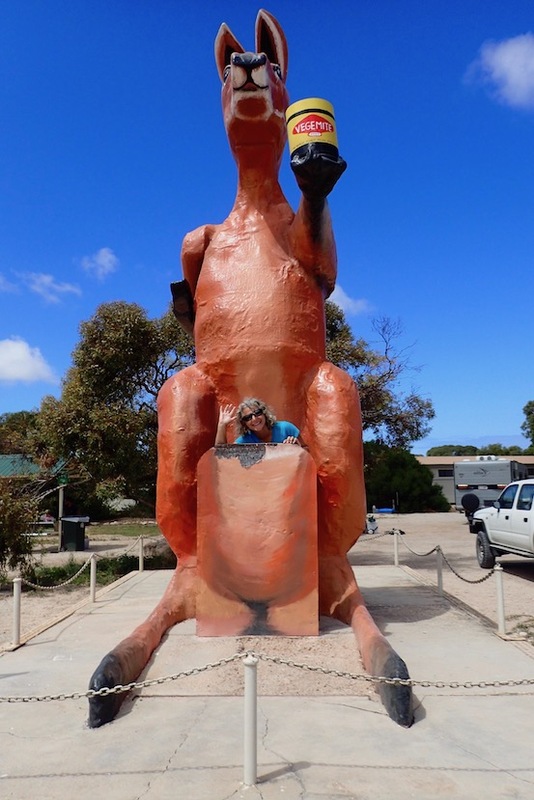 This time, while we traveled far more miles (and wouldn't consider doing so without a 'roo bar! 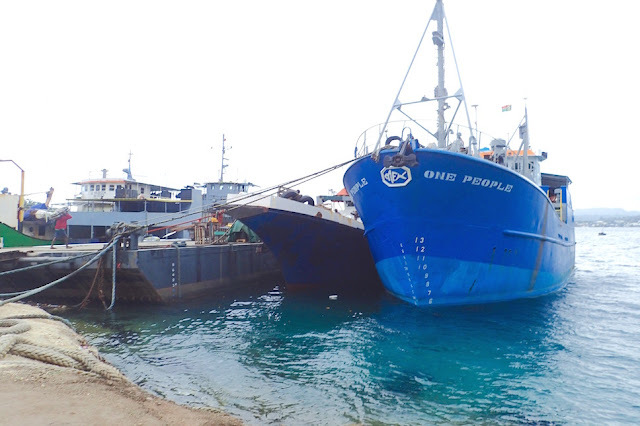 ), we were relieved there was far less carnage. 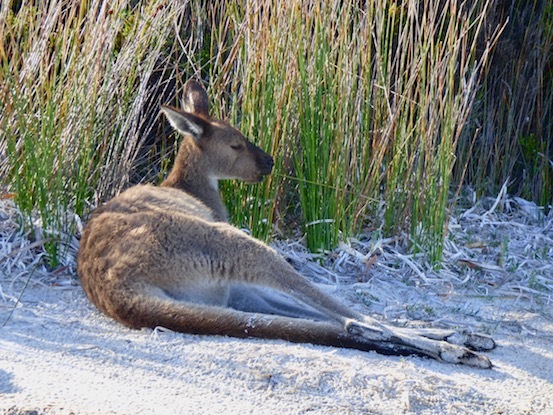 A local explained that the dew on the bitumen (that's pavement to us North Americans) rolls down the sides of the road, thus creating the most succulent grass in Australia's dry season, which naturally attracts the kangaroos to stop by in droves for a nibble. Unfathomable expression on this 'roo at River Island Sanctuary, NSW Australia. When I saw the multitude of dead 'roos, I drove in the height of the dry season; this year, late rains delayed the start of the dry season. Additionally, many Australian ranchers resent these mobile wild marsupials from chowing down on the same green grub their cows and sheep eat. 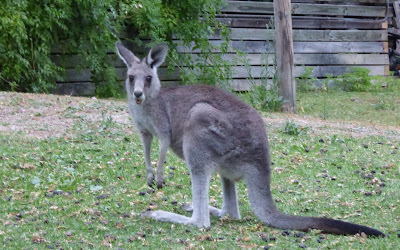 As free-ranging animals, kangaroos have been considered tasty and particularly healthy bush tucker as far back as the Aboriginal days. Roos don't normally hang out at the beach, but they do at Lucky Bay, Western Australia. However, despite the keen desire to manage a sometimes out-of-control burgeoning 'roo population, the acceptance of eating kangaroo meat, while growing, is still far from mainstream. According to a Sydney Herald article in 2008, only 14.5% of Australians were reported in 2008 as eating kangaroo meat at least four times per year. 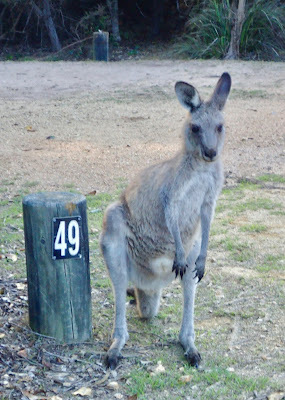 One of the many kangaroos hanging out at Fitzroy River Crossing campground, Northern territory, Australia. "It's like eating Bambi! Kangaroos are our nation symbol!" a horrified colleague gasped when I considered ordering kangaroo off the menu at a company function some years back. I opted out, that time. 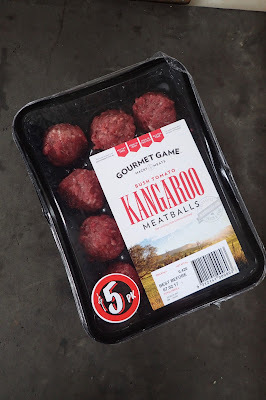 Nowadays, go into any Coles or Woolies (Woolworths -- that and Coles are the two most widespread grocery chains throughout Australia) and you'll find kangaroo meat there. Kangaroos aren't normally THIS big. Nullarbor, Australia. At $10 a kilogram (2.2 lbs), it's become a staple for us, along with "chook" (chicken), as boneless breast sells for $9 a kilo. We particularly like the meatballs, which are nicely seasoned and gluten free; great as little sliders, as pasta or soup or stew meatballs. For more kangaroo recipe ideas information of kangaroo as a food, check out Gourmet Game. Still, I had to laugh at one of locals telling us when she suggested roo meat for her family. The kids looked outside, the hollered, alarmed, "Run, Skippy, run!" We are currently in Emu, on Australia's Queensland coast, making our way to Brisbane. In Brisbane, we'll get our last bit of time with Oz friends, sell our Land Cruiser and fly back to the US on May 6, 2017. 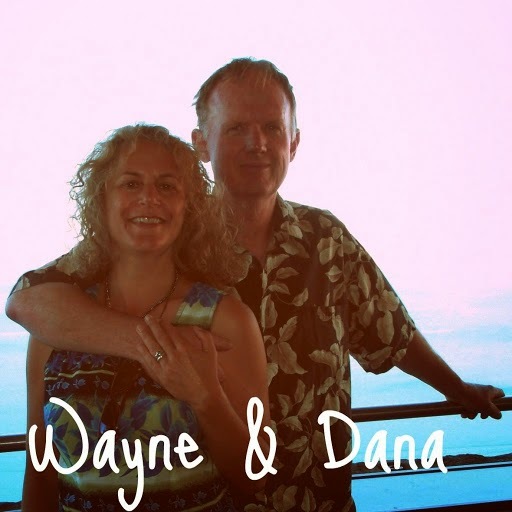 There's still tons of catch-up blog posts. Other than that - wish up the best of luck finding a job and returning to "dirt dwelling" -- at least for a while!